of those musicians who always seems to be on stage when amazing things are happening. I'm not sure he knows how many different groups he's currently playing in, but it's a lot. of Frank Zappa's Mothers of Invention. Chris was born, raised, and still resides in East L.A. (Never to be confused with West L.A.). Jazz, Rock, Blues, World Music, traditional Mexican music, pre-Hispanic music, percussion ensemble, soundtracks, and cartoon music. He attributes his musical growth to his studies with Professor John Bergamo, Pandit Tarnath Rao, Swapan Chadhouri and Leonice Shinemann where he studied tabla, while attending California Institute of the Arts on a full scholarship. Chris was also a member of the award winning Cal Arts Percussion Ensemble in 1979. He attributes his "style"(?) to Listening to EVERYTHING, logging in thousands of hours, practicing, rehearsing,performing and touring constantly with musicians interested in stretching and reinventing themselves throughout the United States, Canada, Europe and Southeast Asia.Chris' drumming is unusual in that it incorporates not only the standard rhythms and their permutations, but also a fluency with odd time signatures and sonic textures, which he seamlessly incorporates into his playing. 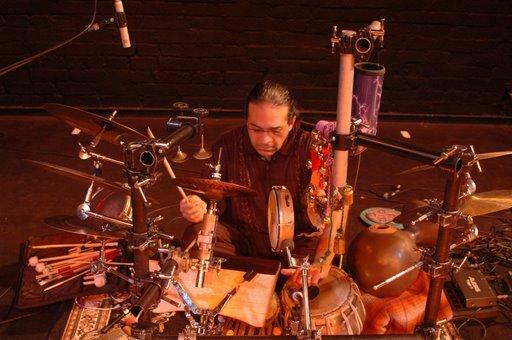 His fascination for New Music and Sound as well as the advent of MIDI technology allow him the possibility of combining textures that have never before been available for the percussionist in live performance. Playing tabla next to state of the art MIDI instruments and being able to blend them musically is a challenge he continually explores. could visit Europe and/or any other country for 2 weeks and vice versa the world would be a much better place. There would be more understanding, not tolerance but actual understanding. North Americans are a very sheltered people. and I am not speaking of music on "technical terms" but on musical terms. and add what you like in order to make a WONDERFUL meal and learn from it. The Meal, no matter how well you learn to replicate it will never be the same way twice. and our mind(s) being wherever it happens to be. we are part and parcel of MOTHER EARTH, and we are all related, and held together by our similarities instead of separated by our differences. PEOPLE and musicians are 2 different things, while not all people are musicians, not all musicians are people. Music is a "COMMUNAL" action, where everything and everyone needs to work in such a way that the TOTAL OUTCOME surpasses any individual contribution, and we always have to be forgiving to ourselves and to the other musicians in order to create something that we would not have been able to create by ourselves. In order to surpass ourselves collectively we need to leave our egos at the door and let the MUSIC be. I am answering this in regards to the musicians on stage instead of the people watching the performance. Depends on the music being made, but I prefer it to be aural, and not oral. The music dictates where we should be and where we should go at any given moment at any given time. I rarely look over to cue anyone in and/or out of anything, this comes from rehearsing. to go anywhere at any given time in time when the moment arises. music of Mexico, where all of these musics contain improvisation but not in the same way. Asian and Latin American percussions? locking parts and patterns, as does music from the Middle East. time frame and the time is more mercurial. But of course there are always exceptions to the rules. Why do you play drums/ percussions? 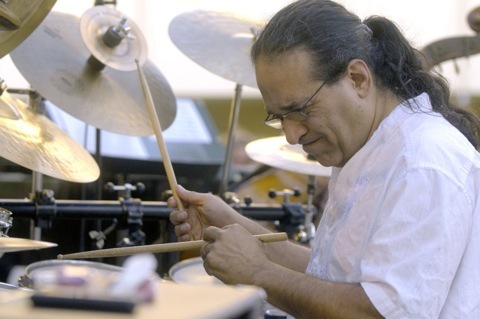 The power of the rhythm is what drew me to percussion and drums. and touch a place that many have forgotten still exists within themselves. which every person shares regardless of race, color or creed or country. Most of us had at least 9 months of rhythmic training before setting foot on the planet. What does music offer you? the same space at the same time and immersing ourselves in eachother is a constant inspiration to me. I am constantly learning and being humbled by the greatness of the musician. Depends on the music I am playing. and that I do a lot of weird stuff with my left hand. and usually so right for the music. and for that moment in time we are all MUSIC.